So, you want to be a Quad Cities Cruiser? It's easy as one - two - three! First, download and print a blank Application from one of the formats listed below and fill it out completely. 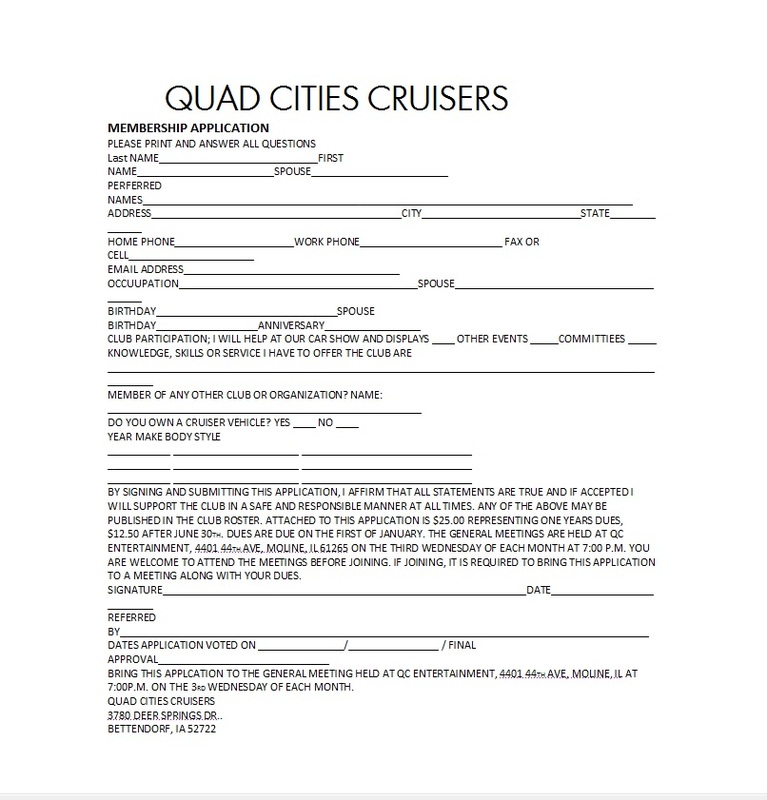 Second, bring yourself, your family if you wish, and the completed application to a Quad Cities Cruisers monthly meeting at AT QC ENTERTAINMENT, 4401 44TH AVE, MOLINE, IL 61265 ON THE THIRD WEDNESDAY OF EACH MONTH AT 7:00 P.M. January - November, excluding July. Finally, submit your application and pay your membership dues...$25.00 if between January 1st and June 30th, or $10.00 after June 30th at the meeting. Our presiding officer will read your application to the membership and introduce you to the Best Car Club in the area. Your application will be read twice more...once at our Executive Board Meeting, then again at the next monthly meeting, After that 3rd reading the following month, you're officially a Quad Cities Cruiser! To download, please choose a file format that best suits your need. It's always a good idea to check the events' phone line as updates come rather quickly & at times which may not be reflected on this website. 2nd Ave. & E. 2nd St.
Cruisin to the Rescue 2! !